The Personalized Fire Pit is the only fire pit on the market that can be personalized to what-ever your heart desires. The Personalized Fire Pit is a wood-burning device that has numerous design possibilities. 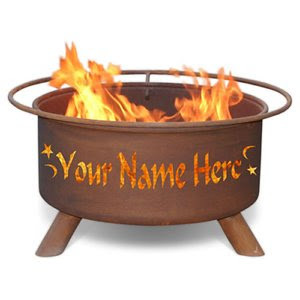 Using a computer laser cutting machine, any text or image that you choose can be cut into this unique fire pit. The hardest decision you will have to make about purchasing this fire pit is what to put on it! With this custom-made fire pit you can choose up to two different lines of text. Each text line will support up to 20 characters including spaces. It will also support up to two unique images. There are thirty-two images available for this product which gives any customer the creative freedom to make their fire pit like no other. The Personalized Fire Pit is manufactured from cold-rolled steel and features a natural rust patina finish. Using a rust patina finish permits this fire pit to age beautifully over time. This outdoor fire pit has been designed as portable wood-burning station which can be easily moved from your patio to the beach. The safety ring that surrounds the fire pit can not only be used as a handle but also function as a footrest for your comfort. This model is secured with strong legs that are welded in place to prevent pit from wobbling. With this fire pit you can enjoy the outdoors while staying warm by a fire highlighted with personality. The Personalized Fire Pit can display your family name, a favorite quote, or even be used as a tribute to your favorite sports team. For your convenience, this product arrives fully assembled for immediate use. 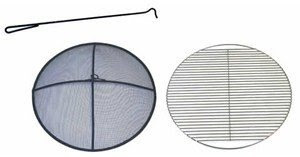 To ensure satisfaction, this product is protected by a five-year warranty by the manufacturer to guarantee that this fire pit will not burn through or rust through. So get those burning-logs prepped for the debut of your new Personalized Fire Pit. The pictures do not do this fire pit justice! I personalized my own pit at Woodland Direct. It adds the perfect accent to my outdoor decor. The fire pit is manufactured by Patina Products and you can visit their website at www.patinaproducts.com to see a complete list of all the different styles they offer.